Looking at a student’s life, it doesn’t look like they have much to be thankful for besides stress, deadlines, money issues, etc. But it’s at times of the year like Thanksgiving where they can look into their lives and find some diamonds in the rough. Thanksgiving feels like a good time of year for students to reflect upon their lives and turn all those things they often think are curses and turn them into blessings. Here are some lemons New York University students are turning into lemonade this Thanksgiving. NYU students feel v thankful the East Village bursts at the seams with cheap food, anywhere from $1 pizza at 2Bros to $5 for a two hot dogs meal at Papaya King. Grad student Elver Ho said his most consistent purchase is the food carts on campus because of its convenient location and price. “The breakfast cart guy outside of Stern with his sausage, egg and cheese rolls. Mad cheap,” Ho said. However, the only thing better than cheap is free. NYU always puts together events where they offer free food, so #bless. For senior David Klein, the best way to get free food is to use the freshies because they never use all their meal swipes. For max food, get swiped into Downstein, Hayden or Lipton for unlimited food, Klein said. We love them, we hate them, we hate to love them. “I’m thankful for Dr. Niels Ringstad and his skill with metaphors or what I call ‘nielisms’… But he is a great mentor, and all around compassionate person who understands the value of quality teaching and mentorship,” Ho said. The only thing better than a caring teacher is a funny teacher, one that can keep you awake in class and actually taking notes. “Quotes from my CS professor Zahran are my favorite. I keep them in a document. Like this one, ‘If I tell you you got 100 on your midterm you would be happy, but it’s binary and it means you got 4,’’ Klein said. Still, there are always those teachers that bring out the sarcastic love in us. “I’m thankful for my professor’s NPR voice that makes me want to fall asleep every class,” sophomore Michael Ellis said. Students have the capability to juggle many things at once, which is not always fun or pretty, but mixing things you like with things you have to do doubles as the best way to multitask. “I’m thankful I can incorporate friends into activities, like getting a meal with a friend or making studying collaborative with a group study sesh,” Klein said. Does this one even need more explaining? Honestly an NYU student feels thankful anytime they can manage to have a peaceful, uninterrupted sleep. And sometimes that doesn’t even require a bed. “I love being able to make beds out of anywhere at NYU. Especially the Kimmel couches,” Ho said. Other prime nap spots often include the Lipton Commuter Den and in class. I honestly don’t understand students who can make it through college without drinking coffee: The magical bean that simultaneously keeps your engine going while also dancing flavorfully on your taste buds. Senior Justine Rosalez feels especially thankful for local coffee shops like The Bean. With its proximity to campus and ample tables to camp at and study, it is an essential part of her daily schedule. “I’m thankful for coffee because I’d be failing without it,” Rosalez said. “I’m thankful for Netflix as entertainment; I love it,” Ellis said. Ah, Netflix and Chill, a millennial themed treat for students everywhere. Yes, it gets used as procrastination tool far too often. But for many students who don’t have money or time to go out and do a destressing activity, Netflix can give the mind a break. Whether it’s at home or between classes, Netflix will always be there for you. Just don’t be that person that watches it in class. If you’re a student, you most likely use someone’s account for free, so make sure you thank your Netflix provider today. Shout out to them. 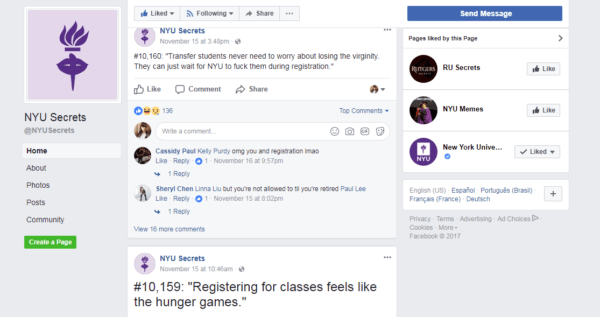 NYU Secrets is the biggest NYU community page in existence. It can feel comforting to see the posts and know you’re not the only person with these dramas/problems. Or even better, to be thankful for all the problems you read about that you don’t have. “I love NYU Secrets. I feel better about myself after seeing their posts,” sophomore David Katzman said. 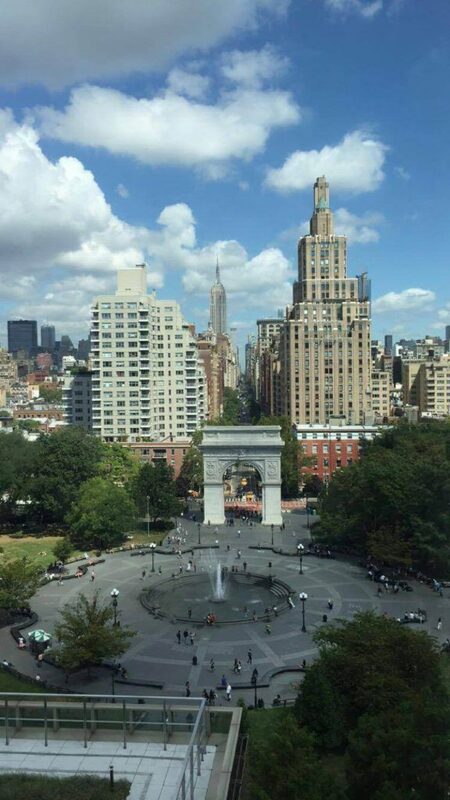 How many students can walk out of class and have a world-famous park at their doorstep? In a city where grass and open space can feel pretty hard to find, WSP gives students the chance to see some green and not rush somewhere for once. NYU junior Emily Chambers loves the WSP dog park. Ever since she started at NYU, she’s spent her breaks watching dogs at the dog park. She even began to notice what time certain dogs would be there and really felt connected to them. “I’m thankful for the dog park being so close to school because I miss my dog. I can’t be with my dog so I like watching other people’s dogs,” Chambers said. Five weeks left of regular school. Count ’em. And to hold us over until we are out, we get three days off school for Thanksgiving. “I’m thankful for the upcoming breaks because “I’m thankful for Netflix as entertainment; I love it,” Ellis said. NYU is such an international campus, so we’re all from different places and I think everyone relates to the excitement of heading home for break,” Rosalez said. Going home for break is the perfect time to step away from school and see the good and the bad for what they are, and still remain thankful for both. Originally from Northern California, Faith is now a senior at New York University studying History and Journalism. She is made up of coffee, sass, Disney magic and pop punk music. Her goals in life are to travel the world and be a panda.